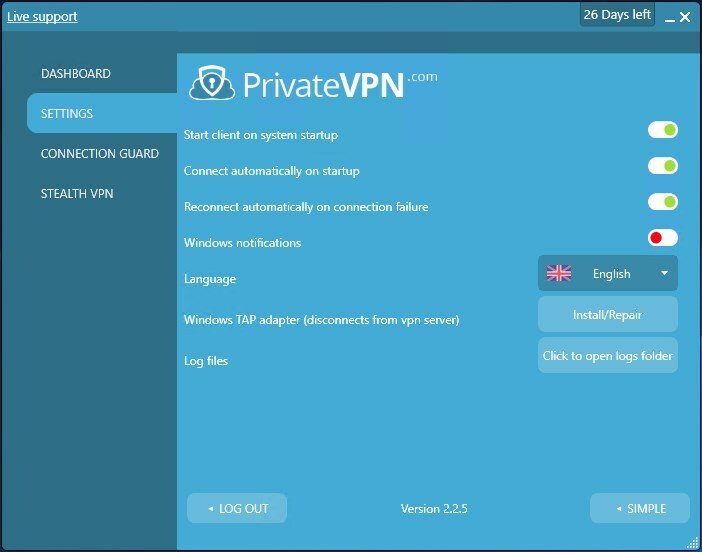 There’s a lot of good things to say about PrivateVPN, especially for Windows users. 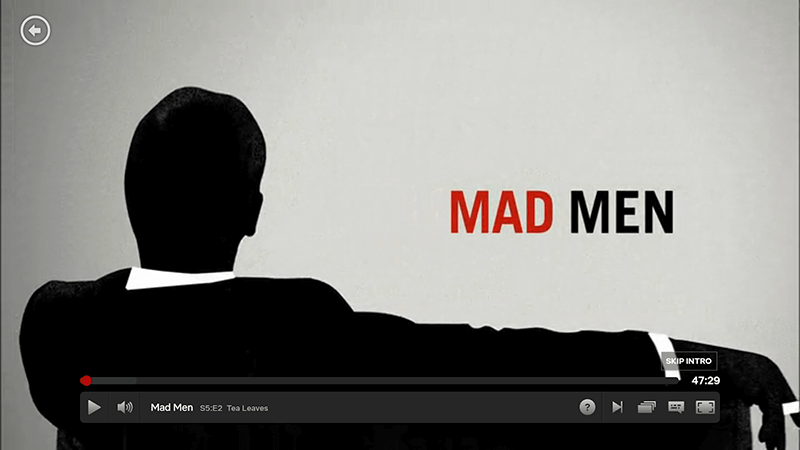 With working Netflix and torrenting options, this is a solid choice. Is there anything you should look out for? PrivateVPN is a no-frills VPN that is both secure and flexible. It aims to suit the needs of all kinds of VPN users. Or at least it seems that way; the PrivateVPN website is vibrantly designed with a level of professionalism that says “Quality”. But what we really want to know is if PrivateVPN’s package is as well-put-together as it looks. In this review, we’re diving deep to find out PrivateVPN’s strengths, weaknesses, and whether or not it’s worth your money. We test with a 100 Mbps connection, with the base speed around 90 Mbps. We lost about 25% which is quite good! PrivateVPN’s speeds are pretty good. It is fast enough so long as you test the right area. We started by testing with our North American server. Tests showed some speed decrease, though it wasn’t substantial. It was fast enough to stream. Our European server gave the worst results. We were surprised considering where Sweden resides in the world. The only server that performed worse than Europe was Hong Kong. The poor results reminded us why free trials are important; it’s paramount that you evaluate a VPN before committing to make sure it suits your needs. So far, PrivateVPN’s speed is great in the U.S. only. 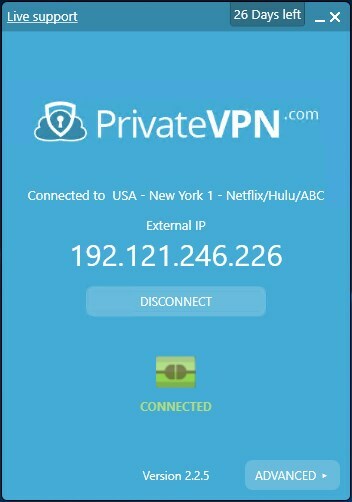 PrivateVPN delivers on Netflix. You can easily access Netflix through both US and UK servers. Those who love watching the news will be happy to know that BBC iPlayer works too. It’s important to note that not all servers have access to Netflix, but there are at least 3 servers that do (which we’ve tested). They claim to have Netflix available in over 21 regions. Netflix in all these regions? Not bad, considering most VPNs fail to deliver Netflix access altogether. Despite the low server count we never felt that our connection speed was too impeded to stream comfortably. However, we have gotten better numbers from other VPN providers that also feature Netflix access. We’re crossing our fingers that PrivateVPN catches up one day as well, but for now, these servers should cover most of your Netflix needs. PrivateVPN boasts P2P friendly configured servers. In our eyes, this gives PrivateVPN a slight advantage over other VPN providers. Any and all torrenting is completely anonymous. PrivateVPN states it simply with, “Even if you’re not doing anything suspicious online, we believe privacy is a basic human right and you do too.” They’ve indicated that they aim to keep your data safe from ISPs, governments, and hackers. These are strong words from a company based in a country that has data retention laws. But we’ll take their word for it—for now. If that doesn’t satisfy your privacy-conscious souls, take a look at our top VPN recommendations for torrenting. PrivateVPN’s offers three subscription plans. They only differ in the amount of time purchased: either one, three, or 12 months. With a subscription costing $3.88 per month, PrivateVPN falls under the category of cheaper VPNs. This is considering their special deal where you get an additional month on top of their annual plan, providing a 64% discount in total. PrivateVPN does offer a free trial. It’s for 7 days and we highly recommend giving it a try to test PrivateVPN for yourself. At the time of our purchase, PrivateVPN advertised a promotion. They seem to do so frequently, so keep your eyes peeled for the next discount. Payment for PrivateVPN is pretty straightforward. The service accepts major credit cards, Paypal, and Bitcoin. After payment, PrivateVPN sent us straight to account creation. It was a seamless transition. Device Compatibility: Use on all your devices! PrivateVPN can be installed on almost every device. Yes, you read that right: even Kodi is supported. PrivateVPN also supports some routers. You can find out if your router is supported by visiting the PrivateVPN page. Router configuration guides are provided by PrivateVPN. Even when your router is connected to PrivateVPN you’ll still have access to Chromecast, Apple TV, and whatever WiFi-enabled devices you own. 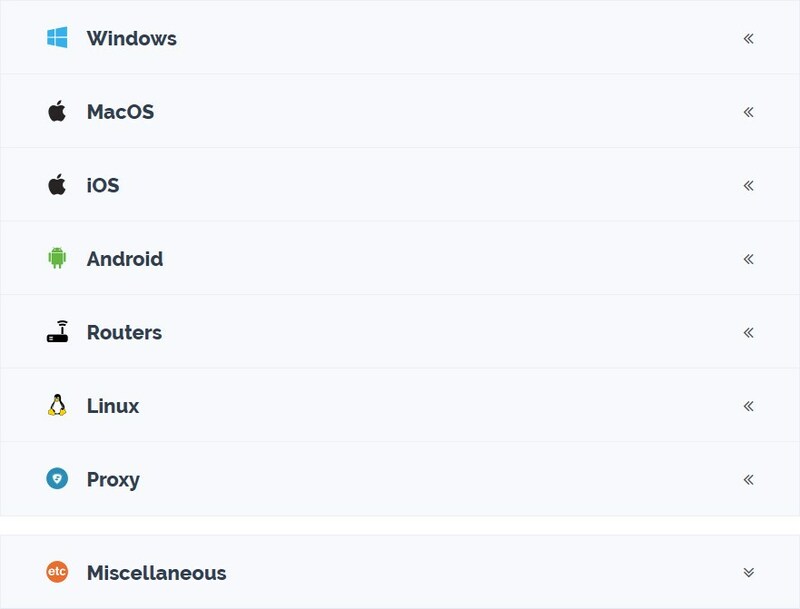 That being said, PrivateVPN is best used with Windows. Signing up for PrivateVPN is a breeze. All PrivateVPN requires is an email address and a password. There’s no need for an activation code to get started. We experienced no issues installing PrivateVPN. 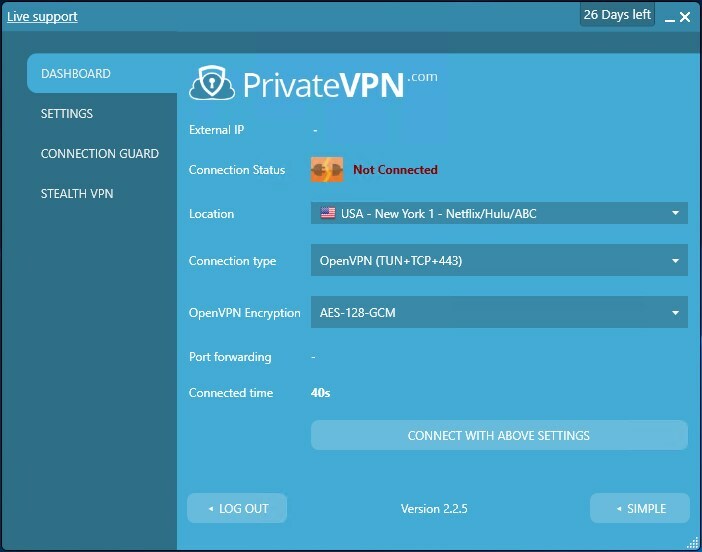 Once installed and launched, you’ll see a simple connected/disconnected icon on the VPN’s interface. There’s also a red/green slider indicating whether PrivateVPN is on or off. PrivateVPN comes with a handful of additional features. Application Guard is particularly useful if you want only certain apps kill-switched when using PrivateVPN. Whereas being able to turn-off IPv6 and DNS leak protection seemed like an unnecessary button for everyday users. PrivateVPN’s uses the same icons across different devices. That makes it easy to transition between devices. There’s one more nice touch to cover. At the top right of the interface, you’ll see a “days-remaining” counter. You always know exactly how much time you have left. PrivateVPN is a fairly intuitive service. But if you find yourself needing help PrivateVPN offers numerous means for you to get it. If you find yourself stuck installing PrivateVPN to your device you can schedule remote desktop assistance with TeamViewer. It’s the extra mile we appreciate. Although we implore you to always be cautious when giving anyone else access to your computer. PrivateVPN’s FAQ covers a lot of common questions you may have. And within that FAQ are links that will help you along your journey. In separate tests, PrivateVPN proved that their service is free of IP and DNS leaks. We tested PrivateVPN through both our North America and Europe servers and found that PrivateVPN properly masked our IP addresses. If anonymity is one of your primary concerns then PrivateVPN gets a seal of approval. PrivateVPN’s main strength is their security. PrivateVPN uses a 256-bit encryption code with a 2048-bit DH key. 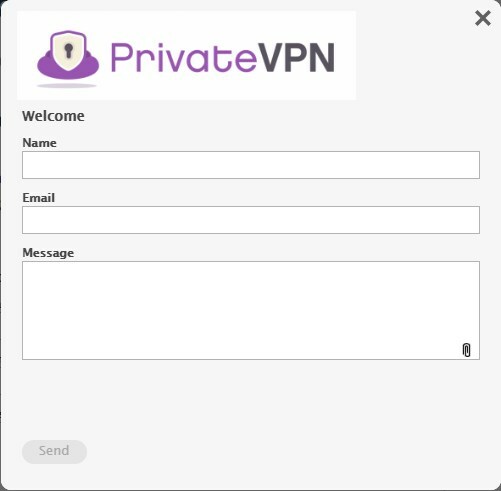 PrivateVPN’s protocols include OpenVPN, PPTP, L2TP, IKEv2 and IPSec. We suggest using OpenVPN because it’s the most bulletproof security protocol. Based on their FAQ page, it’s clear that PrivateVPN uses military grade protection. Which is exactly what users should expect from a secure VPN provider. PrivateVPN supports live chat – hooray! The only problem is it’s not online 24/7. The first time we tested their chat button we received a message asking us to wait. So we waited. And then we waited some more. After about 12 hours chat support was live. Not exactly a swift response, and even though chat support was live it took the customer service representative an additional 20 minutes to respond to our query. Though, the representative was responsive once they began helping us. Other VPN providers do tout 24/7 chat support and mean it. Instantaneous support is quickly becoming a common feature. And if PrivateVPN wants to be competitive it should seek to provide the same level of customer service. There is a full refund policy. But it’s only available for first-time subscribers for the first 30 days (and less than 100GB of bandwidth usage). So if your experience with PrivateVPN sours in the long run, don’t expect a refund. 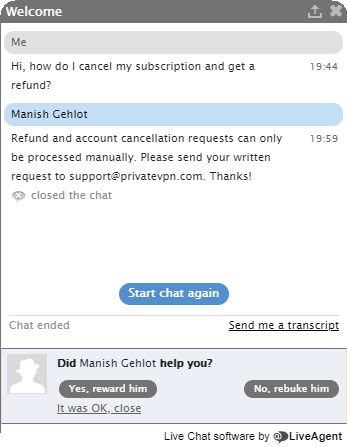 We were not surprised that upon requesting a refund PrivateVPN asked us to state a reason for our cancellation. Then again, asking is understandable. Most other VPNs operate this way. PrivateVPN clearly wants to improve their service and is looking for feedback on what went wrong. Still, we would appreciate if the question was optional. Plus we were told that account cancellation requests are done manually. It’s not very user-friendly. Point being, the best way to maximize your time with PrivateVPN is to use the free trial first. If you’re still undecided by the end of your free trial, give the 1-month package a spin. It’s cheap enough that you shouldn’t feel like you’re making an inordinate investment. PrivateVPN claims to neither log nor collect user data. Although, they do collect cookies through their website. That means non-identifiable information and data for marketing purposes. But they may have third party service providers to help analyze this data. And this may be considered a privacy issue to some. This is certainly worth considering. Since you likely won’t be protected before visiting PrivateVPN’s website. PrivateVPN does not have many servers. Not when the competition sports hundreds or thousands of servers within the same price range. Well, how many servers do we get by using PrivateVPN? There are just over 100 servers spread between 56 countries. It’s not the worst we’ve seen, but it’s far from the best. PrivateVPN does have a kill switch but it’s only for Windows. They have announced that they are working on a kill switch for other devices but there’s no release date as of this writing. Not having a universal kill switch is concerning. Especially for customers who want to connect up to six devices. If a kill switch is a “must” there are other VPNs like ExpressVPN which include a universal kill switch. PrivateVPN has been operating since 2009 although the business officially launched in 2012 under Privat Kommunikation AB. The servers have been performing with 99.98% uptime. That’s pretty consistent and reliable! To date, they have served over 44,000 customers worldwide, with over 15,000TB of data protected. They have an active Twitter and Facebook page. And they respond quickly to people’s requests on their social media channels. Keep in mind that PrivateVPN is a Swedish company. Why does that matter? Sweden is a member of the “Fourteen Eyes” alliance. That means Sweden—along with 13 other countries—shares information in the name of military intelligence. ISP providers that fall under the “Fourteen Eyes” jurisdiction are required to retain the data of all clients for six months. It could be your data. PrivateVPN claims that they are able to keep user’s data away from prying eyes. We’re not doubting them. It’s worth noting that the service does not have any outstanding issues with the Swedish government. PrivateVPN Conclusion: Maybe a good choice for those in the U.S.
PrivateVPN is cheap, fast and easy-to-use. With inconsistent speeds and a Windows-only kill switch, it could be a difficult choice for non-Windows users. They also don’t have a wide range of servers, although they’re distributed globally. Especially since they’ve existed since 2009. The customer service side is reminiscent of another Swedish VPN service Mullvad, which also lost some points due to support availability and response times. What’s with the Swedes and unresponsive customer service? Fortunately, you are backed by their awesome 30-day money-back guarantee should anything go awry. And you have streaming options if you’re looking for a VPN for Netflix. If you’re not in the U.S. though, you should try looking elsewhere, starting with our top 10 list. - Kill switch available only for Windows.